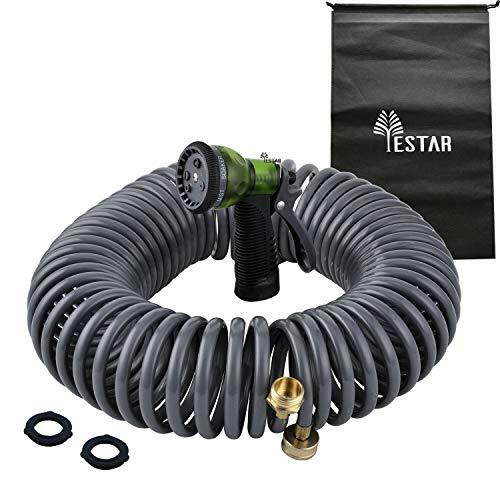 Yestar Expandable Portable 50Ft Garden Hose Reel. Do you enjoy gardening, want to be much closer to nature or just want to keep your backyard plants watered? Maybe you are looking for a compact garden hose nozzle or want to make a gift to your parents who love gardening? YeStar garden hose features a tangle-free 50' coil hose with 7-pattern sprayer. It meets all of your watering needs: watering plants and trees, cleaning gardens and pools, showering your dog and washing car. The turret-head sprayer quickly adjusts the spray pattern, while a rear pistol trigger adjusts pressure. This package includes polyurethane hose and a pistol sprayer. The hose stretches out and retracts into a coil for fuss-free clean up and lawn care. Do not let children use water nozzle alone. Do not face people when using, so as to avoid accidents. All YeStar products come with the installation instructions, installation simple and easy to use, 2-year manufacturer's warranty. YeStar specialized in producing garden watering products, sprayers, garden bags and other garden decoration items. As we have a flexible and complete production system, we can easily meet customer's requirements no matter their orders are big or small, urgent or not urgent. Also, we have our R&D department to develop new products every year. If you have any good idea or design, we are welcome to hear from you and develop these new products together. ADVANCED NOZZLE SPRAYER: YeStar fairy outdoor garden hose has 7 adjustable watering patterns: center, cone, soaker, mist, flat, jet and shower. Water controlling knob for changing the water pressure: rotating bezel for easy choosing kind of spray. Select right type of the stream and water plants, clean garden or pool, shower pets or wash car. INCREDIBLE DURABILITY: The valid using length is 50FT. YeStar spray gun has solid brass connectors, rubber washer, double latex pipe, sturdy on / off valve. No more leaks, tear or cracks. EASY TO USE & STORE: Retractable, lightweight, highly portable. Quickly drain the excess water. This expandable water hose will Never tangle, twist, or kink, flexible and easy to handle and to storage! LABOR-SAVING DESIGN: Recoil memory offer time saving by not having to wind and untangle a heavy wet garden hoses. Rebounds gently will not damage plants or paint. Warranty: All YeStar products come with the installation instructions, installation simple and easy to use, 2-year manufacturer's warranty. If you have any questions about this product by YeStar, contact us by completing and submitting the form below. If you are looking for a specif part number, please include it with your message.